This Craftsman-style house and rear garage at 1310 E. 9th were built for Dr. F. M. Wilmer, a prominent local physician, and his family in 1917. 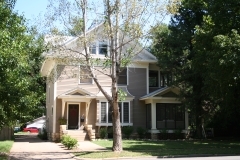 The house utilizes a simple form with natural materials while displaying elements of Craftsman influence in the use of triangular brackets along the roofline, large square columns on the porch, wide overhanging eaves, and built-in interior features. The Wilmer family resided in this house for 47 years - from 1917 to 1964. The property was nominated for its architectural significance. 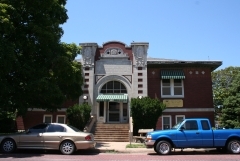 By the early 1890s, there were four bank buildings located at the intersection of Ninth and Main in Winfield. The Winfield National Bank built a two-story brick building at the southwest corner of this prominent intersection in 1879 and significantly remodeled the building in 1916. However, by 1923, the bank had contracted with the American Fixture Company to construct a new building. Just as the 1879 brick building had reflected the bank's investment in the community with its construction of one of the community's early brick structures, the new 1923 Classical Revival-style building reflected financial prosperity and stability. The bank survived the Great Depression, but later merged with First National Bank in 1945 and moved across the street. The building's Classical Revival features include a formal, symmetrical facade and a smooth stone exterior. It has a temple front with paired pilasters framing the recessed entrance and a tall and prominent parapet. 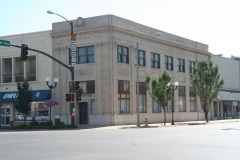 The building is nominated for its local significance in the area of commerce and architecture.